Ever since the Multiplayer Online Battle Arena (a.k.a. “MOBA“) genre entered the gaming industry scene, there has been a certain “mantra” surrounding it; the one about the high number of toxic players in the communities. True, due to the “free to play” model that the most popular games in the genre offer, the gaming communities now witness a massively increased number of players. Some of those players are bringing an unprecedented amount of “toxicity”, i.e. flaming, trolling, insulting etc. In this article, we will focus our attention on the most popular games in the genre, a game with a particular problem with toxic players – League of Legends. More importantly, we will try to answer the question of voice chat non-existence, the reasons why it still isn’t implemented, should it be implemented and the paths Riot could take with this matter. From the first development phases Riot has been doing an excellent job of attracting new players to their title. Since its release in October 2009, the game offered us a “paying” model in which a customer doesn’t pay for a game at all. Instead, a player can buy various skins and trinkets that only affect the game in a cosmetic way. This free-to-play model (F2P) brought a revolution to the gaming market and attracted players in thousands. Incredibly well designed champions that players use in-game, made all the new customers sit down and play LoL for weeks and weeks. Champions vary in style – steampunk, cyberpunk, high elves, orks, trolls, aliens, Nordic and Egyptian mythology, death metal bands, even Warhammer 40K rip offs (Garen, Darius) – everything is there. On top of a big champion selection, no matter how hard you try to beat the game there will ALWAYS be someone better than you. The only way to win your games is teamwork and the ability of your team to become friends and colleagues in those 30-50 minute matches. MOBAs repeatedly punish teams without strategy. Matches are won with unified pushes and retreats and that is exactly why people stick with the game even after months of playing. The feeling when you see your team outsmart the enemy team is priceless. No matter how many solo plays you perform or see, a won war will always be better than a won battle. Churchill said that. Riot focuses a lot of their efforts on pointing out that team work is the overpowering effect in every game. For example, a literal propaganda campaign was launched where Riot explained that placing vision wards across the map helps not only you, but your team likewise. Once the game finishes, players can honour their team mates if they were friendly, or if they communicated well etc. They also implemented loading screen messages that point out various statistics that prove how communication with your team mates brings easier victory. A slightly scary example of the propaganda posters. So how come that a game that relies so much on teamwork and communication, refuses to implement an important feature like voice chat? As always, the answer is not simple. On paper, voice chat is a tool that will make EVERY League of Legends match faster paced, with levels of team work that can be witnessed only in the highest level of the game. Higher level of communication will show us how tactics can be made on the spot, whilst players are still shopping for their items. Ganks will stop being a matter of luck and eye perception, retreats and pushes will become unified, feints will become a rule, not a coincidence. The other side of the coin shows us how huge player numbers are also bringing higher percentages of toxic behavior during games. Even the biggest League of Legends critics have to agree that, at the moment, Riot is doing everything in their power to limit these things to a minimum. The after-game report system (similar to the honour system) lets us report toxic players for numerous reasons. Those reports are reviewed by The Tribunal, a well thought online jury made of players, who then decide the accused’s faith. A smart and interesting system like this one shows us Riot is not afraid to give the power to the people, for the people. The frightening thing about this is that a system of this size was made exclusively for text chat. What kind of a system would a voice chat implementation need? A system that understands its enemy would be a good start. An average toxic player can be explained with the “Social identity model of deindividuation effects” (or SIDE model for short), which points out the process of depersonalization of other individuals in online communities (Chena & Wu, 2013). A person is more prone to flame and grief in-game when they don’t see their team-mates as actual individuals. What’s even more worrying, SIDE model explains that person’s toxic behavior soon becomes a social norm, a way of communicating with others or even a defense mechanism in case player’s performance is not on the level the game requires. In short, a toxic player doesn’t perceive his team as a part of his usual social interaction in the Real World. The norms are not the same, and the punishment is barely existent. If Riot ever wants to play ball with this kind of a problem, they need to bring the toxic player out in the open and stop allowing the toxic part of the community to bury themselves under the rubble of anonymity. With voice chat implemented, toxic behavior can be confronted with direct comments from team mates, whilst at the same time removing numerous reasons for toxic behavior in the first place. Failed focus fire, bad tower dive, bottom lane getting separated – the list of rage inducing moments goes on and all of them can easily be removed. Instead of avoiding voice chat, Riot should see this as a way of reforming their community where toxic behavior will in fact shrink. SIDE model shows us that decrease of social normatives in online communication can be battled if the shield of anonymity is reduced. 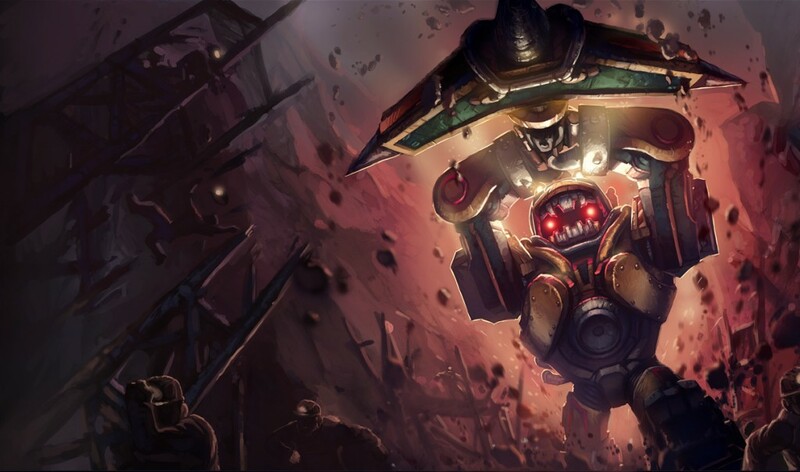 With so much drilling, it’s no wonder Nautilus can’t hear your gank pings. He needs a voice comm! Currently, it seems Riot is not working on adding voice chat feature any time soon. The two dimensional statistics (in which they provided no sources) given by the Riot representative gives us a glimpse on their current stance – the possible issues voice chat might bring highly outweighs possible advantages. Nobody can blame them for being cautious, uncontrolled toxicity can harm companies of their size more than most of us can even imagine. In fact, Riot might end up losing the player base they have been building for years. League of Legends World Finals attracted 32 million viewers in 2013., a number that can be halved if toxic behavior goes rampant as nobody wants to play a video game and feel bad all the time. Except those Amnesia streamers, those guys are just not right in the head. Knowing what risks a voice chat feature might bring, it would only be fair that we bring some possible solutions for expected increase in toxic behavior. Mute option – The first and the most direct way of dealing with a toxic player, without talking with him/her. It’s a simple solution for problems like Eastern European music spam via voice chat, and similar cases that might incur. Vote kick + substitute option – Vote kick feature has been implemented since the dawn of multiplayer gaming. In various cases, the best way to deal with a toxic player is a simple server kick. Not only do we eliminate the source of troubles, we also show the player how swiftly and easily his behavior is being negated. The social norm that SIDE model mentioned can be influenced with this tool. With a vote-kick option, a substitute feature should be added too, as teams need to fill the vacant spot quickly. Riot’s latest brain child, the “team builder” feature shows us how a good lobby system is created. Certainly, a similar player-adding option could be added in standard mixed games. Voice chat ban – Similar to the chat restrictions (or bans) Riot recently implemented, voice chat option could be removed for those players that continuously harass others. Seeing how well the classic chat restrictions are doing so far, adding a similar feature to voice chat is a no-brainer. Report system – A bullet proof report system is probably the hardest thing to implement from this list. A toxic player WILL get reported (the LoL community is doing a great job in reporting bad behavior) and soon enough Riot employees are going to see who the ban candidates are. Still, how do we gather evidence for someone’s behavior on voice chat? This is where we come to the hard part – if Riot want’s a voice chat report system, a recording feature needs to be added. A person should have an option to record the toxic player and then easily send the data to the Tribunal, which will in return need to be updated for this role. Please, cease with the “b-b-but, bandwidth” muttering, I can hear you from here. Indeed, it’s almost an impossible task when it comes to the stability of the game, but it can be done. If there is a company that has the resources and the manpower, it’s Riot. These measures are made to deal with the bad boys in town. What about the features who actively increase gaming experience for other players? Main Caller – A player who communicates in such way that it brings victories to its teams, deserves a reward. The usual crest/ribbon system (Friendly, Helpful, Teamwork) can be updated with another category – “Main Caller“. Any team that sees a main caller playing with them will be more inclined to listen to that his calls, thus bringing teamwork to a whole new level. Support classes should be perfectly suitable for this role, but the LoL meta changes on a daily basis, so we shouldn’t be surprised to see other lanes performing the caller’s task. One language teams – Almost every League of Legends game is comprised of players from various countries. Europe servers are particularly affected by this and sometimes it’s frustratingly hard to communicate with your team, even in text chat. Adding a preferred language option in the “team builder” setup can increase voice (and text) chat usage to higher quality levels. For example, with an option like that a team of five Polish players can use voice chat the best way possible, thus increasing their performance. Most importantly, this option can be used everywhere in the world – from numerous minorities in USA to the vastly diverse Asian servers. These ideas are just a small drop in the LoL ocean and some (or all of them) might not be the best ones you’ve heard today. However, the MOBA competition is getting more aggressive day by day, and most of them are having a voice chat feature implemented from the very start. Riot cannot ignore the lack of voice chat forever, and it remains when (not if) the feature will be added. Until then, Riot is at least making us learn how to type fast.